"bad experience with the seats"
✅ Trip Verified | The airline is okay for a low cost. The luggage arrived just fine. However the seat was really tight and there was barely any legroom. The seats do recline however I could not recline it because the seats were so close to each other to fit more passengers on the flight. It was a full flight from Malaga, Spain to Barcelona, Spain. And when I tried to recline an inch the passenger behind me punched my seat. The crew was not very attentive and did not want people getting up to use the toilets. Very bad experience with the seats and it ruined my experience with the airline. ✅ Trip Verified | The A320 seat pitch in economy is dire. I am 6 foot and had to spen over 2 hrs with my knees jammed against the seat in front. This was made worse because the seat backs are hard plastic. The only way to relieve the pain was standing up to go to the toilet. If you are over about 5’6” you will suffer. "seats do not recline at all"
✅ Trip Verified | The seats on Vueling do not recline at all! After spending 7 hours waiting for a crew for our flight, to not be able to recline your seat to try and rest a bit, really was an insult to injury! Vueling gets a huge thumbs-down from me! ✅ Trip Verified | Seats pretty bad and outward flight last row tilted back in semi recline couldn't adjust. Both of us kept sliding down seat was not comfortable. Legroom just awful im 5’7 my knees almost crammed up against next seat. Even worse no lower seat pocket just hard metal with curved edges was not nice kept banging my knees on those protruding bits god help anyone over my height you will suffer. "There is not much space"
✅ Trip Verified | There is not much space in this type of A320 aircraft, my mom is not very thin and really didn't want to sit near the Window. I thought it was just her complaining, but even I had trouble standing up and walk past the seats. Instead I was just leaning on the seats holding on to the back of the seats to be able to walk past. When you sit it's fine. The armrests can go up and down, which gives you more space when you sit next to the aisle. 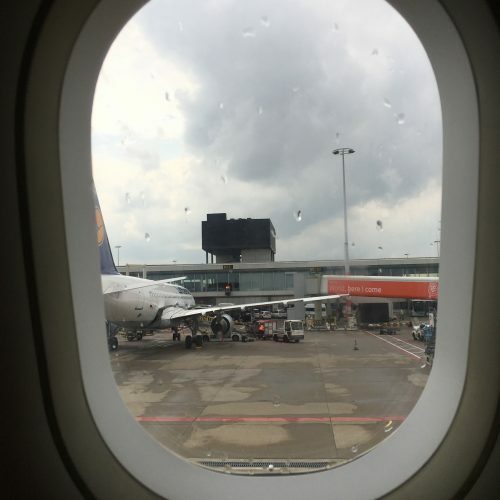 "worst seats and the tightest space"
✅ Verified Review | Overall great service, however, the worst seats and the tightest space I have ever seen in an air plane. I am only 1.65 cm / 5 foot 5 and my knees were touching the front seat and I had to do some acrobatics to cross my legs, eventually bonking and bothering the person seating in front of me. Hard cushioning as well, if any. 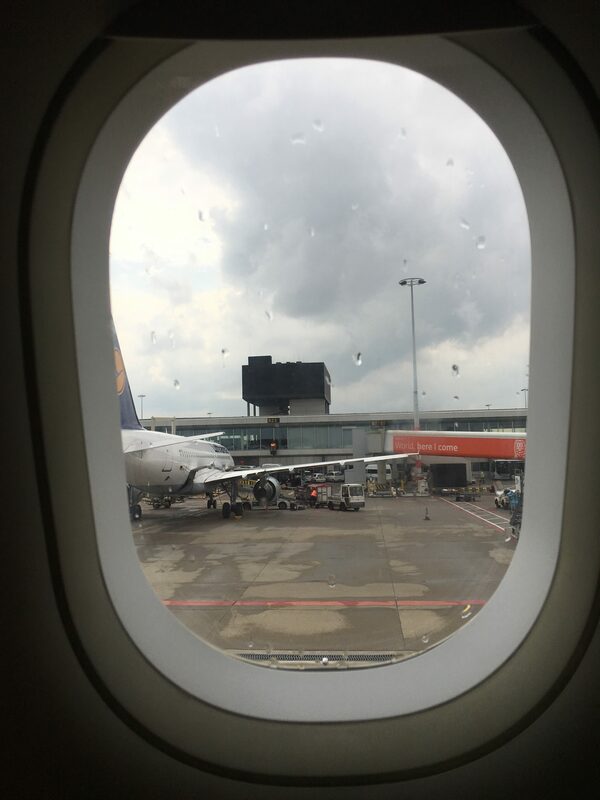 ✅ Verified Review | I sat in seat 6F, the seat was pretty comfortable, and it had a great alignment with the window, you could see a prefect view of the middle of the engine and a bit of the turbines. The legroom was ok, I think it's pretty good for a low cost airline. What was a bit annoying was that the seat didn't have a USB port. The seat was good for low cost flight. Most uncomfortable seat ever, the boarding process it botched up, normally starting from rows 15 to 32 (they manage to squeeze 32 rows where other airlines do 30). 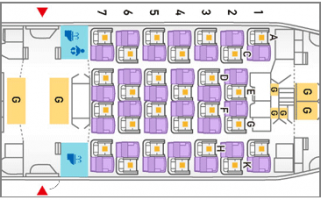 However, the attendants allow passengers from the back rows to occupy all the overhead bins in the front. The end result being: you pay extra for the front rows, you board last and to make it worse, you have no space to put your bag, completely stupid system. Unfortunately flying out from Barcelona means Vueling is your only option for many destinations, so you are captive audience and they know it, they do zero effort to improve their terrible service. "seats were a little cramped"
Can't really complain about flight or service, the seats were a little cramped. The biggest complaints are that on the return flight we were all allocated different seats dotted all over the aircraft although we had two children aged 6 + 8 and they were expected to sit on their own. We did manage to change seats do we were sat near the children but this resulted in the six year old losing his blanket and they haven't been able to locate it - this gives me the impression that either the cabin is not cleaned or they would have found it and we were told it could not be found. "seats are just too tight"
I'm normally a fan of cheap airfares and recognise you get what you pay for. The seats of Veuling are just too tight though, while the price was low the seats mean there little value to me flying with them. I'm just under 6 foot and my knees were on the seat in front. You are also just incredibly close to everyone in front and behind you - I'm not normally claustrophobic on planes but I really got a sense of that on Veuling. If I really needed to get somewhere urgently I would put up with the seat - but otherwise I'd probably pay twice as much just to avoid the experience, genuinely.